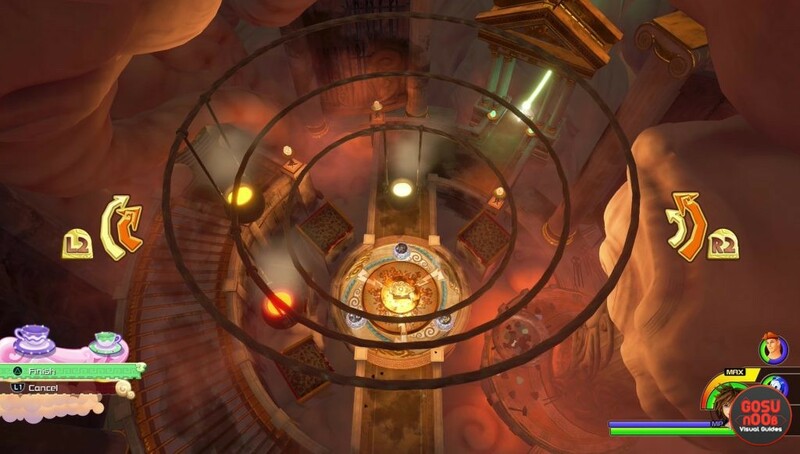 Olympus forge puzzle is a challenge in Kingdom Hearts 3. In order to solve it, you’ll first have to find the secret forge, then figure out how to operate it. Once you’ve solved it, you’ll get a new weapon for Goofy, called the Knight’s Shield. It has a silhouette of Mickey’s head on the front, it adds 4 strength and two skills – fire syphon and burn protection. In case you can’t solve the puzzle on your own, our Kingdom Hearts 3 Olympus forge puzzle solution guide will help you. How to solve Olympus forge puzzle? First of all, you’ll have to locate the forge. Travel to the Corridors waypoint in the Realm of Gods – it’s the fifth fast travel point. Head up the stairs on the right and ride the rail. Let the stream take you into the chasm. When you reach the bottom, you’ll realize you’ve entered the forge. You’ll see a big anvil in the middle of the main platform. Interact with it, and you’ll start the puzzle. As our heroes jump into their magical cups the camera will pan, revealing an intricate system with three rotating cauldrons filled with molten metals. The one in the inner ring is stuck in position, but you’ll have to use your trigger keys (L2/LT and R2/RT) to turn the middle and outer ring. Your goal is to align the cauldrons. The outer one moves faster when you rotate counter-clockwise, while the inner one moves faster when you rotate clockwise. Use this knowledge to align the two with the inner one, and press triangle/Y. This will tip the cauldrons, mixing the hot metals and ultimately pouring the mix into the mold on the anvil. Here’s a video showing the whole process, step by step, with a showcase of the Knight’s Shield in action near the end.